Failed to start OpenStack Identity Service (code-named Keystone). When you installed Openstack using packstack you might have faced openstack-keystone service issue. When try it to restart it fails with code-name keystone error. I have done some research on it and found the solution. Now openstack-keystone service will not start as http service is already in started mode and we haven’t created any relation between openstack-keystone and http service. So to start openstack-keystone service we have to create symbolic link and point openstack-keystone service to http service. This post describing multinode OpenStack installation on centos7/rhel7 for Liberty release. If you want to do single node installation please refer my earlier post. Following is 3 node Openstack Architecture and related Openstack services running on respective nodes. I am using two network one is management network of 192.168.56. * which is used for internal communication between nodes and one external network used to assign public IP to VM and to access instances/VM from outside. I am also using NATed DHCP ip on each nodes to download required filesets from internet. Many times I have encountered this issue that user is waiting for long duration to get password prompt. I used to type fast and working on couple of windows so hate to wait for longer duration just to insert my password. I have searched about this issue and found out the cause so sharing that with you all to avoid waiting window. Solution is very simple. Whenever user is login using SSH its going through reverse DNS lookup and searching host details from machine IP address before login to machine. This is helpful for security purpose but our default configuration and SELINUX security does that job anyway. This is default setting present in sshd_config for reverse DNS lookup. In this post I am going to show how to do network configuration in rhel7/centos7. We have ip command introduced in linux way back but we never used it. In this post we will use ip related commands which isnot easy to use as it has many options need to provide to get relevant output. to see IP address details normally we used ifconfig command we check the same using ip addr show command. Here we an see ipv4 address of eth0 interface along with ipv6 address and network UP status and mtu size. Today I am going to show you how to use access control list (ACL) permissions in rhel7. Traditionally we have assigned permission to one user/owner and one group for file or directory but in some cases we need other user or other group apart from owner need to have readonly access or write access on same directory. To achieve this we have access control list permission concept in Linux. Other users and and groups can also access file or directory even when they are not owners and member of group who is having ownership on that file or directory. we use only two commands getfacl to see ACL permissions on directory/file and setfacl to set ACL permissions. We can even set default ACL so that new files and sub-directories created in directory will inherit ACL permissions of parent directory. The filesystem needs to be mounted with ACL support enabled. XFS filesystems have built-in ACL support and Ext4 filesystem in RHEL7 have ACL option enabled by default. In earlier versions of RHEL you may need the ACL option included with mount request. First we see ACL permission on file named prod.conf. 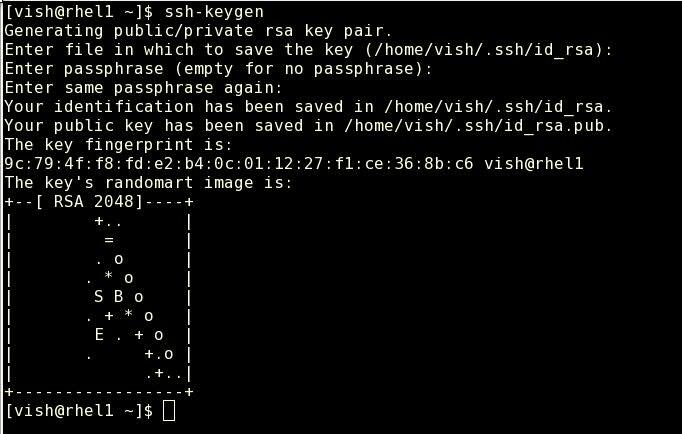 In this post I am going to show you how to configure SSH key based authentication on rhel7/centos7. Configuration of SSH key based authentication is little different in rhel7 compared to traditional method of manually copying public key to another server. Users can login using ssh with password and authenticate using public key authentication. On every server we have two keys private and public. Private key is used as authentication credentials like password which must be kept secret and secure. Public key we need to copy on the server where user want to login and used to verify private key so public key does not need to be secret. How authentication happens in SSH key key based authentication. SSH server that has public key can issue a challenge that can only be answered by system who is holding private key as a result user can authenticate without password only with the help of public key and system grant login access to the user.